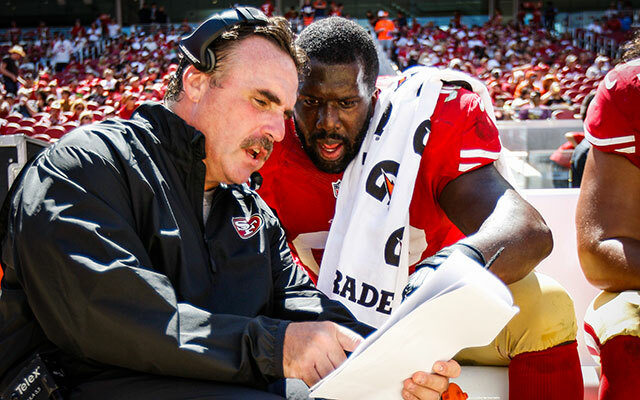 Tomsula's background is certainly one a little different from the norm. He has gone from sleeping in his car to selling carpets to cleaning Piggy Wiggly parking lots and delivering newspapers to several years coaching in NFL Europe until getting to the 49ers in 2007 as the line coach. He actually spent more years in NFL Europe than he has spent in the NFL. He is highly regarded as an assistant and he has done very good work with his line units as part for some tremendous Niner defenses. His players love him and he gives the franchise the benefit of familiarity and continuity as they have said they are not engaging in a rebuilding process. That said, there certainly is some risk here. Even with how highly regarded and respected he is, Tomsula has only worked as a positional coach in the NFL and has never served as a coordinator. You don't see positional coaches going right to becoming a head coach without any coordinating experience and while one could point to John Harbaugh's success after being hired as a head coach after serving as a secondary coach, he also had been a very successful special teams coordinator. And as San Francisco is trying to win right now, making someone with relatively little experience the head coach does have some inherent risk. And Tomsula also has to deal with the fact that he is following in the shadow of Harbaugh, who brought quick success to a franchise toiling in mediocrity and whose dismissal has been highly questioned by virtually all. Plus he is going to lose defensive coordinator Vic Fangio, the key architect of the strong San Francisco defenses these past few years, as he was passed over for Tomsula for the head job and he has to find an offensive coordinator that can fix Colin Kaepernick. The 49ers were all but certain to be downgrading at the head coaching position after Harbaugh's departure but even with how much the players love Tomsula, the team may have been better off bringing in somebody with more experience or the background to fix the key woes that led to the team's setback in 2014.